Integrating Psychotherapy and Pharmacotherapy - Description | W. W. Norton & Company Ltd. This book invites the reader to participate in a major initiative of the 21st century: dissolving Cartesian mind-brain dualism. 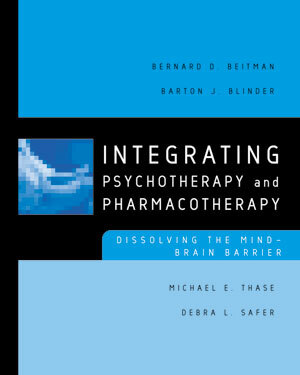 This book will help all mental health clinicians to dissolve their conceptual mind/brain barriers by recognizing the reciprocal influences of psychological and pharmacological interventions. This task is approached by challenging the reader to respond to thought-provoking questions and problematic case vignettes in the following subject areas: combined treatment research, pharmacotherapy during psychotherapy, psychotherapy during pharmacotherapy, the pharmacotherapy-psychotherapy triangle and integrated treatment algorithms. Each of these homework-based sections is introduced by a brief overview. Part I invites the reader to an overview of these many issues. Topics covered include: 1) research in combined treatments, 2) pharmacotherapy during psychotherapy, 3) psychotherapeutic aspects of pharmacotherapy, 4) the pharmacotherapy-psychotherapy triangle, 5) treatment algorithms for combined treatments, and 6) the neurobiology of psychotherapy. With thought-provoking questions and vignettes of problematic cases, the authors invite readers to participate in working out these complicated issues. Part II provides cutting edge information on issues of integrated and split treatment and psychodynamic neurobiology. Answers to the problems are provided at the end of the book. Two additional chapters thoroughly review the research in combined treatments and what is known about the neurobiology of psychotherapy. Advances in neurobiological knowledge and neuroimaging technology havecontributed greatly to our investigations into the nature ofself-awareness. Psychotherapy is a crucial element in the nation's healthcare system; yet there is no standard introduction to its practice.